Following the explosive Charlottesville riots that left one dead, Ilia Calderon stands face-to-face with KKK leaders Christopher and Amanda Barker. From the moment that Ilia Calderón steps out of the car, there is tension in the air. It is the aftermath of the explosive Charlottesville “Unite the Right” rally, which ignited riots that left one dead, and Calderón, a journalist with over 20 years of experience is the first black person to set foot on this rural forest property. The home she is entering belongs to Christopher and Amanda Barker, Imperial Wizard and Imperial Commander of the Loyal White Knights, also known as the Ku Klux Klan. In an attempt to understand their racist, anti-Semitic sentiments, Calderón digs beneath the scriptures that the Barkers fiercely shield themselves with. The Barkers are set firmly in their beliefs and Calderón is determined to contest them. From the very beginning of the interview, she is faced with racial slurs and little respect from both Barkers. Yet throughout the hour-long process, she refuses to back down even once. Christopher Barker claims that the white knights are nothing more than a Christian group and that all their actions are in the sole effort to praise Christ. Both Barkers completely reject the idea that the KKK is either violent or hateful. However, the pair later states that if shooter Dylan Roof, who massacred nine black people at a church in South Carolina, had targeted a “worse neighbourhood” then his actions would have been justified. Calderón refuses to let such inconsistencies lie. Her use of short, jarring questions throws the Barkers off their guard. She points out their contradictions and uses their own words as a challenge. The entire interview is much like a confrontation and although Calderón is outnumbered and on enemy territory, she never once allows the Barkers to gain the upper hand. The tension escalates as Calderón confronts the Barkers at every step of the way. No Bible verse or statement is left unchallenged. When the conversation shifts to immigration in America, the tension finally begins to erupt. Calderón, an immigrant herself, asks how they plan to chase out the 11 million immigrants residing in the States and how they planned to chase her out personally. When Calderón presses the issue further, it becomes one of the most explosive moments of the interview. “You’re a n—–. That’s it.” Christopher Barker says, after a failed attempt to leave mid-interview. His wife, Amanda Barker, laughs. In these intense moments, it is admirable that Calderón never loses the cool she has cultivated so well, instead, maintaining her composure and professionalism in the face of hatred. 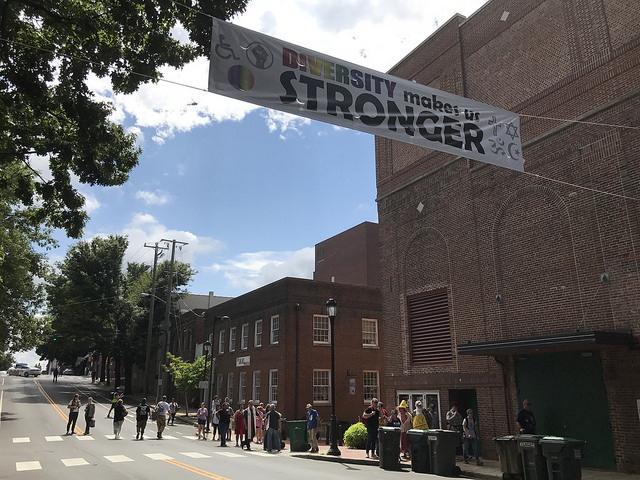 Photo: Charlottesville “Unite the Right” Rally by Anthony Crider available HERE and used under a Creative Commons Attribution. The image has not been modified.